Elmo... Can He Be Trusted? 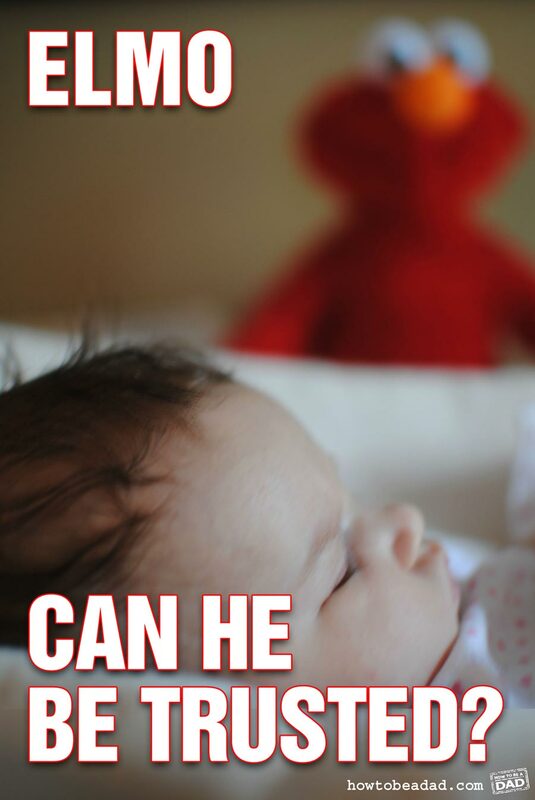 Elmo… Can He Be Trusted? Who are you comfortable with watching your kids? No, seriously. Everyone parent goes through this, who they’re okay with watching their kids and who will never even come near the list of potential date-night facilitators. Everyone has relatives and friends they well know and love, but wouldn’t feel comfortable leaving alone with their kid for longer than it takes to make a marshmallow explode in a microwave (about 30-40 seconds by the way). So we make our lists, ruthlessly cutting people as options, maybe even fighting between ourselves. It’s a process. And every parent’s gotta go through it. Who can be trusted? Ahahahaha! Okay, no it can’t. But Like it anyway. in this pic’s he looks scary! Dude, that picture of Elmo is über creepy. I am right there with you. We have a very short list of people allowed to watch our kids. You might be okay to be around but not by your lonesome with my kiddos. Wait, scratch that. There are people who I don’t even want around my kids with me there! Our list of people who can babysit without question includes the grandparents and the other grandparents. And that’s about it. LOL! Grandparents for us too. And a handful of friends. A small handful. This was awful when my kids were little & we were a military family. Finding a sitter I was comfortable with was so hard. (And we needed a sitter quite often with my ex-husband’s jobs!) And just about the time we found the perfect one & had everyone comfortable & feeling safe, BOOM, it was time to move again. Ugh. So glad my daughter is a teenager now & can watch her brothers when I need her to. And the boys are old enough now that I can even leave them alone for a bit if I need to run to the store & my daughter isn’t home. It’s like a whole new world for a mommy!! PS That Elmo is SUPER creepy! That’s tough – MAN! – it’s tough any way you slice it. It just is. I’m looking forward to when one of the boys is old enough / trustworthy enough to look after Lucas. It always throws me to read about your Lucas because my youngest is Lucas also. Only he’s eight. And he’s like having THREE boys all by himself! We have this discussion every time we talk about our pathetically nonexistent will because everybody who theoretically could watch our kids is deemed unacceptable by one or both of us. Thus if something happens to us, at this point, it looks like our kids will simply be raised by our cats. Ha ha ha ha ha ha! Cats can be really loving too, when they’re not disinterestedly licking their buttholes. 😉 Ha ha ha ha! We just moved here about a year and half ago, so we don’t know a lot of people and very few of them are people we trust to watch our son. Luckily our go-to babysitter is actually my son’s former daycare teacher, but if she isn’t available we are screwed. We have no family near by and even if we did, I wouldn’t trust my own parents with my kid. My inlaws, yes definitely. My parents? No way. “If _______ we are screwed.” My god, how many things I could insert into that phrase as a parent. My first baby is due in 5 weeks and I have no idea who we will trust to watch her. No one for a long time 🙂 then maybe my mom. Definitely my sister. Yeeeeeah, the quality of allowing kids to watch or play around incredibly scary/inappropriate movies is gets a check mark on our NOT list when it comes to baby sitting. We have only two people that we let babysit, the grandma’s. We are terrified when our baby is around the extended family, which is usually at dinner. They all smoke, are through their second alcoholic drink, or are nearly 80 and slightly unsteady. The big problem is that our baby loves being played with by all of them. It’s such a common problem. It’s so emotionally trying too when the people are family or really really close. Yep…our list is the grandparents and that’s it. This is a very sensitive subject in our house, we do not EVER leave our kiddos with anyone but my mom or mother inlaw. 3 years ago we left our 13 month old son with our sitter who had been watching our kids since my eldest was born which was ten years. I was gone with my older kids and was gone exactly 30 minutes only to return to find the person who I trusted with the safety of our children for ten years had stepped outside to take a “Very important” phone call while the baby napped. During that time he had climbed down from our bed where she laid him (instead of his crib) and got into the bath tub, turned the water on and drowned. I am sure there are amazing sitters and nannies out there, but if Grandma isn’t available no matter if it means missing work (or quitting in my case) we do not leave our kids. There aren’t words to appropriately respond to such tragedy, so all I will say is that I’m so so so sorry for your loss. How does one respond to that sort of situation beyond the expected grief? Does the baby sitter get a pass? Do they face criminal charges for negligence? I don’t think I would have been able to stop myself from throwing that person against a wall, and I’m not a violent person. I was going to have some smart comment about the cat, but after the last comment, I’m a bit more sober. I have 2 friends (both in consideration for God-mother to our girl) and all grandparents that I trust without question. After reading this thread, I don’t think that list will be expanding any time soon. My mom, my sisters, and my best friend. That’s it. Unfortunately they all have pretty busy lives, so the hubby and I don’t get out without our toddler much. He just turned 2 on Friday, and we’re finally getting our first night without him; My best friend of 20-some years is spending the night so we can go to a wedding. Even though the wedding is about 20 minutes from us, we’re getting a hotel room so we can have a few at the reception.